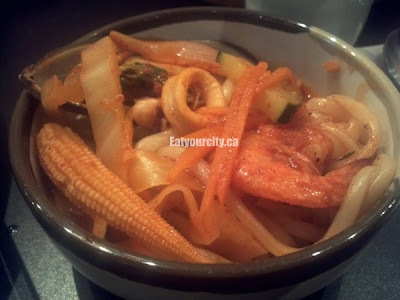 Eat Your City: Wing Chicx Kal Bi Que Charboil Korean BBQ Cuisine, Edmonton, AB - Tasty homestyle Korean! Wing Chicx Kal Bi Que Charboil Korean BBQ Cuisine, Edmonton, AB - Tasty homestyle Korean! Rating Service 9/10, Food 8/10 Despite its long winded name, Wing Chicx is a little gem, and we've been to it twice in the last 2 weeks. Mmmm! But I'm getting ahead of myself here. Its hidden in the strip mall Parson's Centre behind Delux paints on 425 Parson's road (your gps will lead you several blocks away cuz noone's gps is up to date with all the new construction deep south). Inside this little restaurant, you'll find some beautiful glass art pieces, bright cheerful colours along with yummy aromas coming from the kitchen and friendly and attentive staff. The owner and wife speak English, though not all their waitstaff do - one night we got by with laugh out out pantomime and gestures as most of the time, the place is packed with Korean families - who speak Korean and will help hapless guests like us out. And if you haven't figured it out, its family style serving here, so bring some friends if out want to try out more dishes! 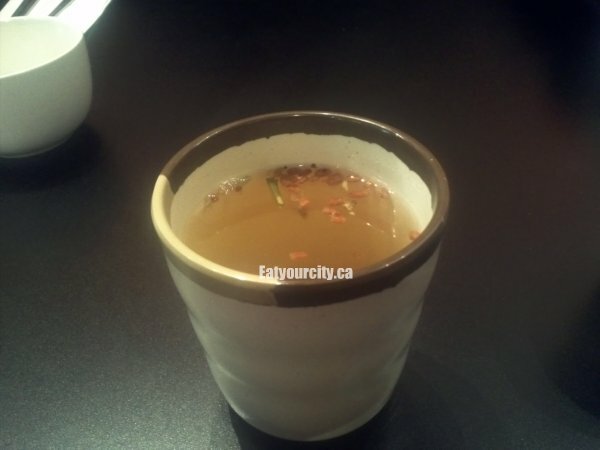 the DRINKS Without being asked, you're served a cup of freshly brewed aromatic puffed rice green tea to warm up from the chilly weather. There's juices for kids available, beer (imported, domestic and draft) and of course soju - a distilled rice liquor that packs a kick in the teeth that is held in high regard in Korea as sake does in Japan. With every traditional family style Korean meal, you're presented with an array of starters. Since its cold out, they have went a step further and the first course you're presented with is a small bowl of congee - rice boiled down in a savory broth with a touch of finely diced veges... its not large serving, but serves its purpose to warm you up to your toes. The Kongnamul was my fav - a simple cooked bean sprout salad tossed in lots of sesame oil, roasted sesame seeds, and a touch of shaved carrots for sweetness and colour served cold. This refreshing cabbage slaw made for an easy peasy and tasty palate cleanser. Not sure what it was called though. You can't have a Korean meal without some decent Kimchi - lightly brined, with a good balance of crisp and not too mushy cabbage with a mild-mod amount of heat from the chilis. We asked for a few more orders of Kimchi too heehee! The macaroni salad stood out a bit as a non-traditional item, and was your standard macaroni with mayo. Definitely preferred the traditional Banchan items better! So, here's 2 visits worth of food - the first time around was a late dinner and the lighting was dim, so we had to go back for lunch on a sunnier day :) The Spicy seafood noodle in soup was something I ordered on a night I was really craving something soupy, hot and comforting. Well, this soup satisfied all of the above and more - loaded with seafood - some shrimp, mussels, little clams and calamari as well as lots of veges - baby bok choy, baby corn, carrots zucchini and cabbage in a "ooh its getting spicier and spicier" broth chock full of springy never gets soggy noodles. The Bulgogi Beef hotplate was my boyfriend's fav of the night - lots of tender melt in your mouth pieces of thinly sliced beef cooked in a slightly sweet sauce served on slivered onions and sliced cabbage on a sizzling hot plate. There was a generous amount of sauce - perfect to go with the bowls of complementary white steamed rice. The Bulgogi hotpot in soup was also a winner, loaded up with thin tender pieces of beef, lots of veges and a bit of glass noodle swimming in a very mildly spicy savory broth. And if lots of beef, cabbage, carrots and other assorted veges wasn't enough, there's an egg swirled into the hot pot to cook to add a bit more heartiness to the hotpot. Stir fried sweet potato noodle, glass noodles, chopchae/japchae...call them whatever you want, but I forgot to order this yummy item the first time we went, and I rectified it the second time around. 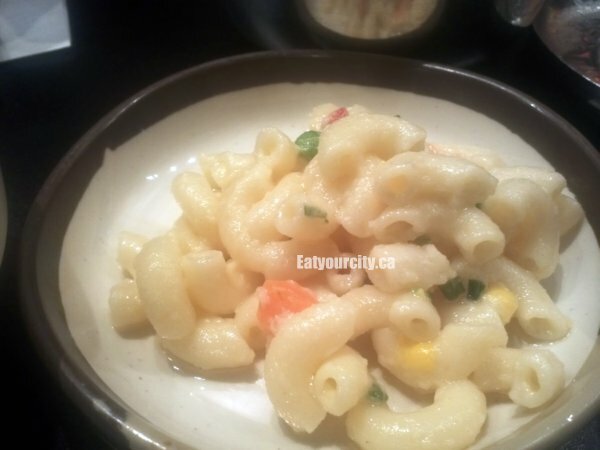 Its a simple dish of springy noodles stir fried in a sweetened soy based sauce and sesame oil. They came out a bit over sauced (and not as springy as I normally like), but they still made my noodle happy stomach happy! 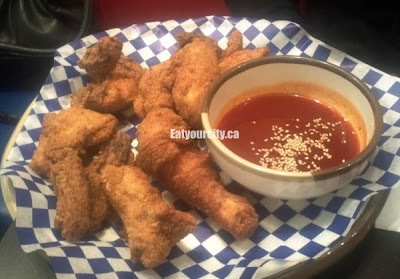 Now the first time we walked into Wing Chicx, we couldn't decide if the restaurant was trying to shape itself into a takeout type place where folks could pick up fried chicken and Westernized fare, or if it wanted to shape itself as one of the best family style Korean places in the deep south of Edmonton. (We sincerely hope its the latter) So, we ordered 1/2 a fried chicken to try out the other 1/2 of their name. 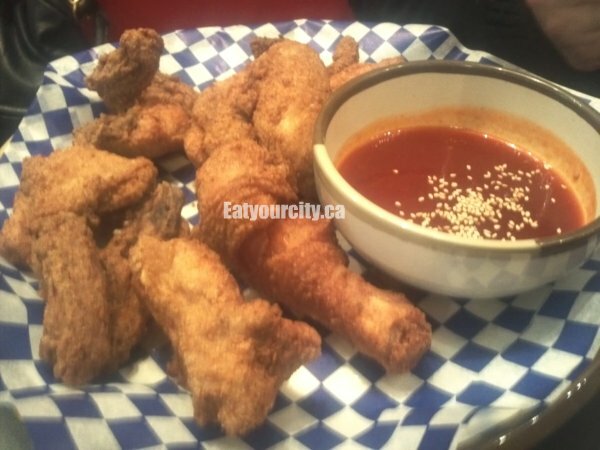 Their fried chicken is normally deep fried and then tossed in their signature sweet-chili sauce (other sauces available upon request), but since we weren't sure how spicy it was, we asked for it on the side. 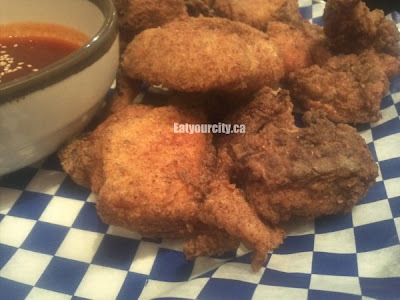 The chicken was lightly dredged and deep fried - now it may have been the late night, but the chicken was a bit dry and tasted quite a bit better dunked in what turned out to be a very mild sweet chill sauce. There is just something about these tender ribs that have a sweet and savory glaze on them along with a nice faint charcoal smoke that you just can't enough of and don't want to stop eating them! You can share with kitchen shears provided (If you really want to). NOM! 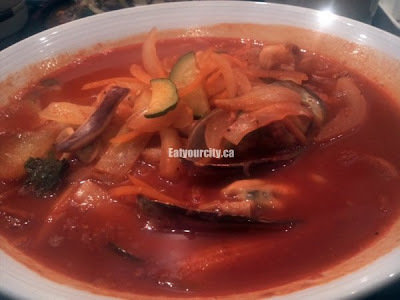 Overall, a great family style Korean restaurant with attentive staff, finger licking good BBQ and down to earth homestyle Korean cooking. Will have to find out what's on their dessert menu soon as we were too full each time to ask! There's vegetarian fare, but will have to explore that next time too... now, are you gonna eat that last piece of short rib...?